This makes me nostalgic for Christmases past and reminds me of all the people I wish I could be with who made so many holidays so memorable. That's a good thing because I'm not good with the holidays these days. 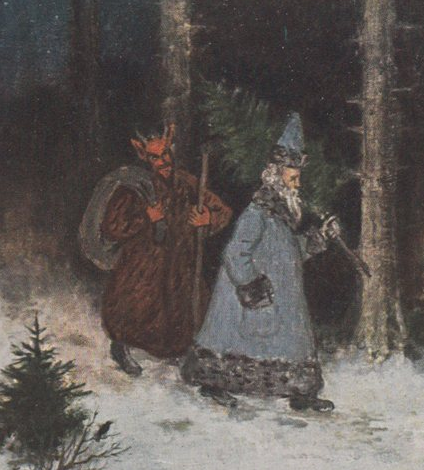 Wishing a magical holiday to all you wonderful people out there in the dark! Gaylene Ffrench isn't bothered by typecasting. In the role of Maddalena in the Northern Opera Company of Manchester's latest production of Rigoletto she is relishing playing a vulgar prostitute. But if you ask her fellow cast members they'd tell you she's not acting at all. The more we get to know Gaylene the more we see that she is loud, brash, rude and licentious. Between her promiscuous come-ons to every male member of the cast and her frequent insults hurled at the more talented female singers Gaylene has managed to make enemies of the entire company. They dislike Gaylene so intensely that when two attempts are made on her life they are not taken seriously. Especially when, in her constant grasping at any type of publicity, she runs to the newspapers rather than the police. However, when she dies bizarrely via an electrified doorknob outside her dressing room the opera company must reassess those previous accidents and start looking for a murderer among themselves. 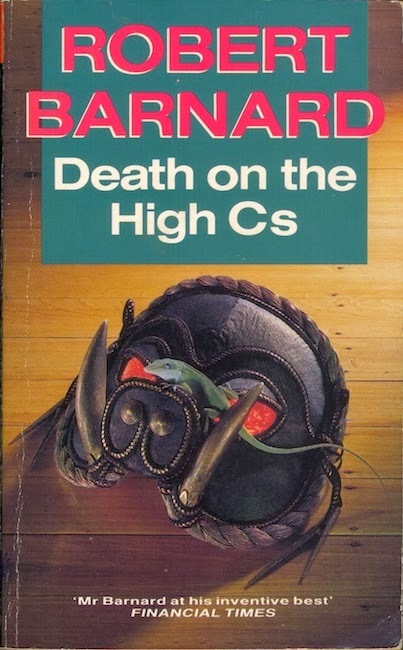 Death on the High C's (1977) was Robert Barnard's third detective novel. He has a field day satirizing the many vain and egotistical performers so often lampooned in novels about opera singers, but he is also highly knowledgeable about the world of opera. As is the police detective Superintendent Nichols who at first plays dumb about the music in order to catch the cast and crew off guard. If there is anything to criticize it is an assumption on Barnard's part that his readers are as expert in the world of opera as he is. As much as I dislike "info dumping" a little more background on some of the plots of the operas and composers would have been appreciated by a rookie opera fan like myself. I resorted to Google to help fill in the gaps that Barnard and Nichols and the Northern Opera Company omitted. The writing is at times arch and ostentatious with a wry humor that on occasion made me laugh out loud. Every now and then the satirical touches are tempered with moments of quiet drama as in the scene when we learn that the singer playing Rigoletto is taking care of a severely disabled young girl in his home, a fact he'd prefer to keep very private. For the most part though this early Barnard mystery novel is less somber than some of his later books. His wit and clever plotting reminded me more of Christianna Brand than Agatha Christie who he greatly admired. Today is a salute to the recently departed Robert Barnard. 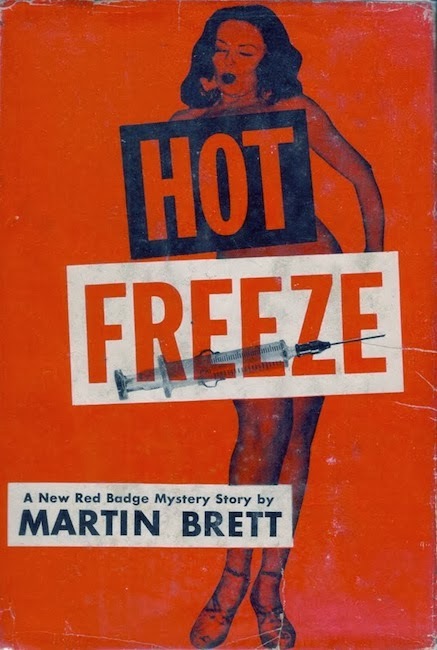 For more about his wonderful detective novels and crime fiction please visit Patti Abbott's blog where you will find links to the other contributions for Fridays Forgotten Books. 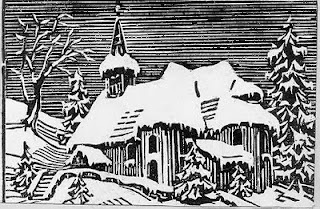 Advent Ghosts 2013: "The World in Solemn Stillness Lay"
Each year at this wintry holiday time Loren Eaton who blogs at I Saw Lightning Fall invites bloggers and creative writers to contribute vignettes for his Advent Ghosts celebration. It's a Flash Fiction Challenge of sorts but with a word limit set at exactly 100. No more, no less. It's also his community tribute to the Victorian tradition of telling ghost stories at Christmas time. This year I was lucky enough to be invited to participate. Here's my contribution. It's inspired by a well known M.R. James story. "The World in Solemn Stillness Lay"
Yesterday there was a light in the window of the steeple. Now it was out. Yesterday, a blanket of snow untouched before the church. Now there were footprints. Yesterday, carolers singing near the pine trees. Now they were gone. Was it digital trickery? The picture must alter over time, he thought. Some clever technological magic. But it was a woodcut on handmade paper colored with inks, not a photo. An old fashioned Christmas card, an old fashioned image. He wasn't frightened, just mystified. Then he looked at the floor and saw the puddle and a trail of tiny scarlet footprints. 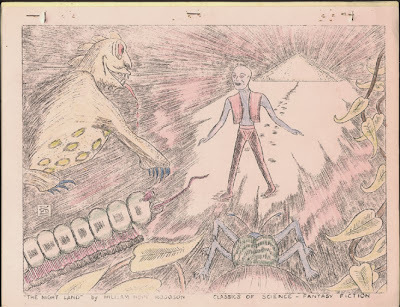 For more chilling vignettes of a mere one hundred words please visit Loren's blog where he has gathered all the links from the participating writer's various blogs. Wishing a very merry Christmas to all you wonderful people out there in the dark. Ready for another weekend house party gone wrong? The myriad guest list includes an world renowned explorer, a Russian prince, a woman violinist, four titled aristocrats and a young British poet. Who'd turn down that party? You'll even be greeted by a suspicious butler of French extraction. 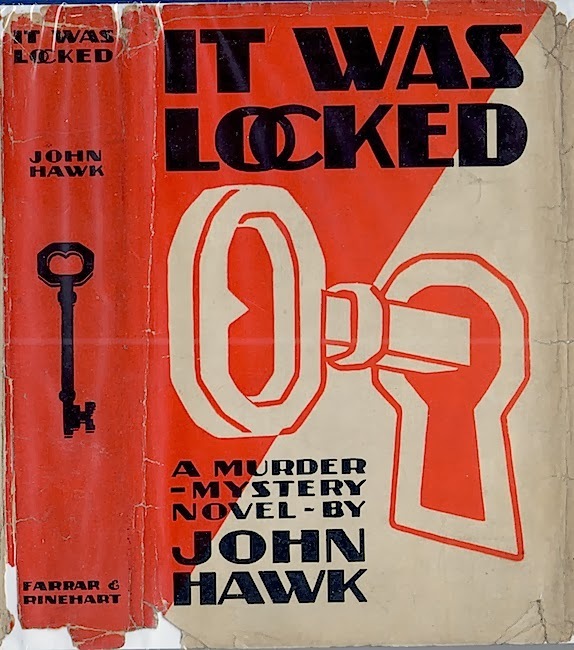 Add one locked room, one murder victim, a curious weapon and the familiar motif of the "wrong man accused" and you have It Was Locked (1930), yet another formulaic detective novel drawing upon tropes already getting cliche as we enter the third decade of the twentieth century. Why then did I accept the invitation to this party? Well, there were enough oddities to keep me turning the pages. Too bad nothing really paid off. 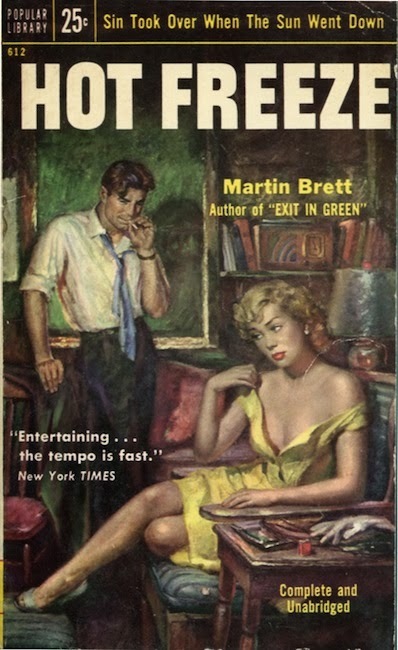 An overly sensitive poet allows his wounded pride to get the better of him and he flees a weekend house party after being humiliated by a beautiful woman, her fiancée and a couple of other guests. Rather than subject himself to further embarrassment by reading his flowery love poetry to the guests as requested by Lady Dorothy, his hostess, Robin packs his bag, locks the door to his room, pockets the key unknowingly, and escapes via his bedroom window. Minutes later Lord Edward Winston goes missing. The search is on for both the missing earl and the mysteriously absent poet who was expected to entertain the guests. Lord Edward is found stabbed in the locked bedroom and Robin is immediately suspected of the murder. An involved inquest that reads more like a very biased criminal trial further implicates Robin when the coroner’s jury finds a verdict of murder and names Robin as the evil deed doer. He is arrested, jailed, and spends most of the book pining over his rash decision to run away. Meanwhile, the police inspector and all of Robin's friends believe wholeheartedly in the poet's innocence and do their best to find the true culprit. How could such a docile childish young man ever kill anyone, they variously muse? The solution to the crime hinges on the murder weapon, a hunting knife of French Canadian manufacture bearing some incriminating initials. 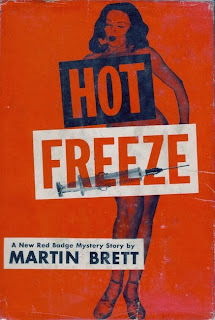 Assiduous detective work reveals the weapon is tied to a long hidden blood feud having its origins in the forests of Canada where trappers do a lot of heavy drinking and carry life long grudges. This is supposedly a locked room puzzle as suggested by the bland title. The puzzle in this one -- how did the body get in the room if Robin had the key and no duplicate key existed? That part of the story offered so many interesting possibilities but the reason is explained, not so believably, in a very offhand manner. Hawk apparently didn't care how the body got there and none of his characters questioned how it mysteriously moved from its hiding place to its position when the door was broken down. 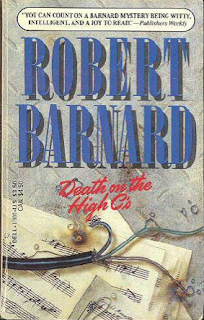 Sloppy writing and careless plotting fairly ruins an intermittently entertaining detective novel that turns into a thriller in the final chapters. It Was Locked, a rather hard to find book with only two editions in hardcover and no paperback reprints available, is barely worth tracking down unless you are interested in the author’s very strange ideas of Canada of the 1920s. 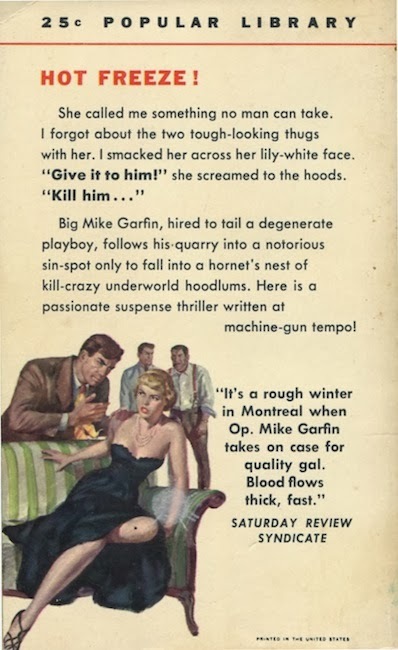 Hawk would have us believe French Canada is as stereotypically savage and violent as a pulp writer’s idea of Italy being populated with nothing but Mafioso thugs. A mysterious death, a bizarre murder method, a locked room, inheritance schemes, fraudulent wills, secrets galore and a horde of suspects unwilling to cooperate -- all the makings of a grand old detective novel of the old-fashioned school. 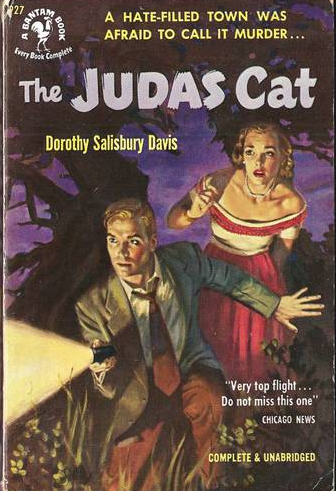 Dorothy Salisbury Davis takes these intriguing ingredients of a traditional whodunit recipe and created The Judas Cat (1949). She whips up a tale of long held family secrets while simultaneously exploring the effects of small town's population at the mercy of corrupt businessmen and an opportunistic mayor. The death of 92 year-old Andy Mattson arouses the curiosity of reporter Alex Whiting and Chief Waterman. The man is found in his locked home with a starving and out of control cat prowling the outer room. Mattson died from an apparent heart attack according to the coroner, but with a look of utter terror on his face that leaves Alex Whiting asking several questions. What exactly happened in that room to terrify the old man? Was he frightened to death? Why was the room locked? Why did the cat need to be killed to prevent it from attacking the two men investigating the scene? Delving into the life of the reclusive nonagenarian Whiting and Waterman uncover a secret side to Andy Mattson known to only a few. He was a toymaker of ingeniously designed wooden wind-up figures and had sold many of them to a toy manufacturing factory in the next town over. Mattson was also a mathematical wizard with superior engineering skills and had collaborated on some designs for hydraulic equipment during World War 2. 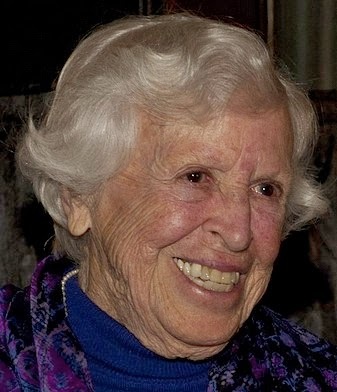 Both the toy designs and hydraulic equipment lead to another inquiry into the legal ramifications of patent ownership that complicate the plot and provide a strong motive for Mattson's possible murder. Add to these facts the search for a hidden will and there is quite a bit of fuel that make Mattson's death seem less than natural. Davis in her first crime novel shows a mastery of both plotting and characterization. Though on the surface it has the appeal of a puzzling detective novel at the heart of the novel is a profound study of the after effects of a violent death on the entire population of a town. From the nosy neighbor Maude who clearly knows a lot more than she's willing to tell to the Machiavellian town mayor to a sinister veterinarian the cast of characters is rife with intriguing personalities with plenty of skeletons in their closets. A climactic town council meeting that s calls into question the investigative methods of Chief Waterman and his unorthodox use of a newspaper reporter as a deputy is one of the highlights of the story. During the meeting the chief accuses the mayor of plotting with wealthy Henry Addison, owner of Addison Industries and is sure that some business chicanery is at the heart of Mattson's death. Anthony Boucher one of mysterydom's most insightful and prescient critics, called The Judas Cat "rewardingly perceptive novel" and predicted that Davis would be a writer to watch in the future. 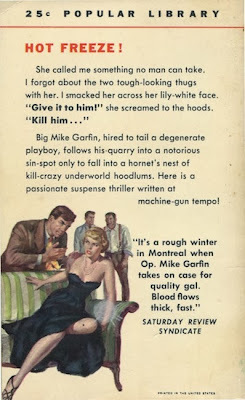 She proved to live up to the promise of this first captivating novel with a run of top notch suspense stories that further developed the crime novel and elevated out of the realm of the too often maligned whodunit.